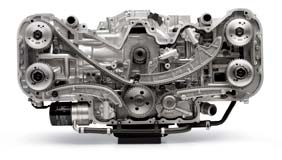 The Subaru Boxer engine that comes with every Subaru Model Vehicle has a horizontal design that helps to create a quiet, smooth ride by canceling out vibrations caused by engine fire & piston movement. This natural dissipation of vibrations eliminates the need for vibration absorbing components that may require maintenance or replacement, which means more cost to you during service. Most Subaru models come equipped with the 2.5-liter or 2.0-liter Flat-4 that combine capable power, efficiency and smooth operation. 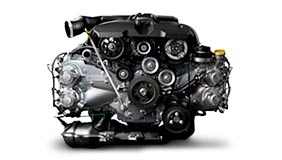 You can also find the 3.6-liter Flat-6 Subaru Boxer Engine with 256 horsepower in Subaru Legacy, Outback, Forester, and Tribeca model vehicles. Each is tailored to meet the performance requirements of our customer's needs. 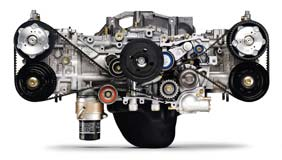 Increasing responsiveness and providing quicker handling than vehicles with V-type engines or Inline engines, the Subaru Boxer Engine is designed to provide a lower center of gravity than other designs. The horizontal design type of the Subaru Boxer is almost perfectly symmetrical to help create a well balanced vehicle that will give you the control you desire, when you need it most. 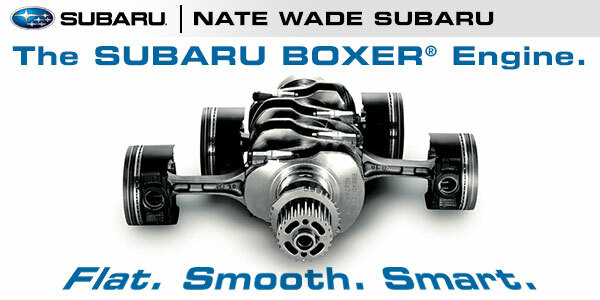 Give Nate Wade Subaru in Salt Lake City a call today at (888) 586-8323 for more information on the Subaru Boxer Engine in your specific Subaru model vehicle.